Since the founding of New France, the Church was ever present in the daily lives of residents. With the arrival of the British, Protestantism gained ground within the territory. To offset this, the Catholic Church drew in its flock even closer and played an increasingly important role in family decisions and politics. Ultramontanism settled in and dominated life until the 1950s. Ultramontanism is characterized by the absolute rejection of any compromise between Catholicism and modern thinking, and prioritizes a religious society over a civil society. In short, Outside the Church, there is no salvation. This set of doctrines is present primarily in Francophone Catholic populations and was even more so in Quebec at the time. 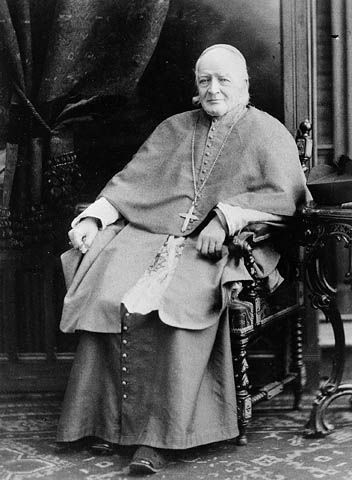 The proponents of ultramontanism, very powerful during the 1860s and decades thereafter, advocated several principles: power over education; legal reforms aligned with Canon Law (marriage, paternal authority, lifestyle, etc. ); monitoring of civil legislation by the episcopate, etc. According to this doctrine, liberals and their ideas should only be perceived as anticlerical radicals. Contrary to his era, Wilfrid Laurier did not champion Catholic and religious involvement in social life, and in politics in particular. Despite having Catholic parents and a classical and religious educational background, he never considered the precepts of the Church in his personal and political decision making. © Musée Laurier 2019. All rights reserved.